Improving Senior Health Care Through Powerful A.I. 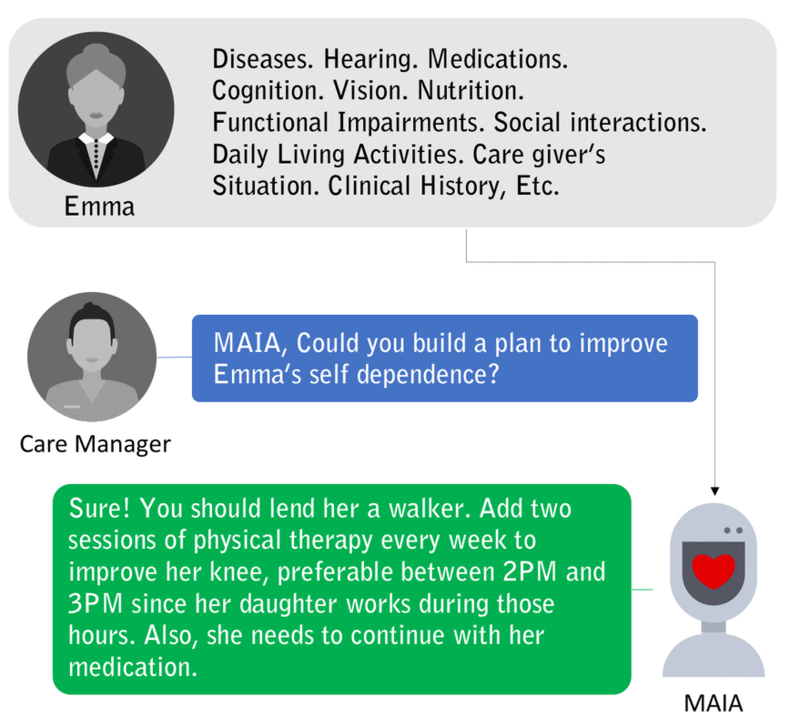 Everyone should receive health care tailored to their personal needs, so we created MAIA, Medical-Artificial-Intelligence-Assistant, a world-class health care professional assistant for senior care. MAIA uses state-of-the-art machine learning to process patient health records and propose the optimal care plans to improve the patient's health. Nowadays, a health care professional assigns the health care service plans each patient receives based on their own experience. Each patient has a unique health history. It is overwhelming for professionals to keep up with a large number of patients. MAIA helps health care professionals give their patients a more personal quality of care without being slowed down by algorithmic work. Our A.I. leveraging the intrinsic properties of hundreds of thousands of outperforming plans collected during 17+ years. Our platform can propose new care plans that increase the chances of improving patient health. Building better, personalized and cost-effective care plans will keep patients healthier and cut healthcare expenses. Our partners are the Care Design Institute and the service provider company Saint Care Holding Corporation. MAIA leverages the intrinsic properties of hundreds of thousands outperforming plans when applied to particular individuals. MAIA can propose new care plans that increase the chances of improving patient health.